Just after 10am everyone walks down to the entrance to Macenmist truffiere. We are about to hunt for black gold. Everyone is rugged up against the cold and as the mist surrounds us we all walk through a foot bath before following Tawdiffu into the plantation to find truffle. The season is now well underway and the truffle is ripening as the soil surrounding the trees gets colder and colder with every frost. The cold temperatures are making the truffle smell better and everyone seems to enjoy the pungent aroma. We have had a really good start to the truffle season and with each hunt more ripe truffle is being unearthed. Tawdiffu still works on lead as she is young and very fast to find truffle. This means that potentially if she was off leash she could damage the truffle with her nails. 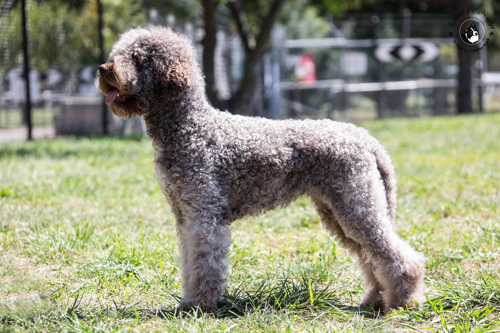 She is very enthusiastic and tends to dig very fast and deep if left to her own devises. So by necessity we walk close to her. Nature being fickle, we never know if anything will be ripe or if we will even find truffle on any given day. Let’s hope that today is a good day. Yes we are lucky, truffle has been found and as a reward the dog is given an assortment of treats. These treats are sourced from frozen meat left-overs and could be any type of meat treat. Needless to say the dog is happy to show us all where to find the truffle in order to obtain a tasty morsel. 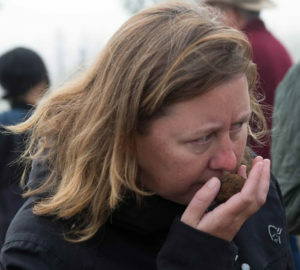 Once the truffle is found and unearthed it is passed around for everyone to inspect and smell. 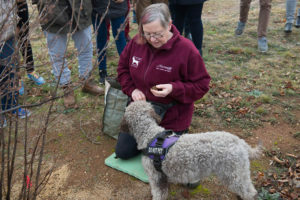 Those venturing out on the truffle hunt also get to dig for truffle. As time progresses we find more truffle under a number of trees, but the weather is still slightly chilly so after a good haul, the consensus of opinion meant that it was back to the warm truffle shed to clean what had been harvested. 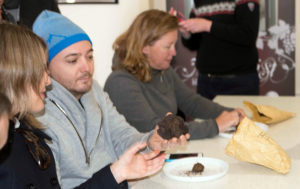 Before cleaning, the truffle is weighed and then re-weighed again when clean to demonstrate just how much soil needs to be cleaned off them before they are ready for market. 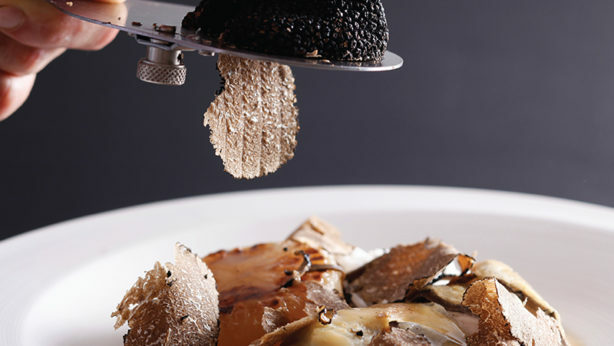 Once the truffle is cleaned and cataloged it time to sit down at the table and enjoy a 3 course truffle luncheon.